If you bet on hell freezing over before Verizon once again offered a plan with unlimited data, well, you lost that bet. Amazingly, the carrier that just last year told its customers that they don't need unlimited data has now decided that maybe they do after all. Let's get one thing clear first. The data traffic is technically unlimited, but after the first 22GB used each month per line you could be subjected to throttling. Then again, it's unlimited data. At Verizon. Oh, how things change in the mobile space. Anyway, the plan is intuitively called Verizon Unlimited and it costs $80 (with paper-free billing and AutoPay) for one line. As you'd expect, it also gives you unlimited talk and text. The price goes up to $140 for two lines, $160 for three lines, and $180 for four lines. If you need more you can add up to 10 lines per account for an additional fee of $20 per line after the fourth. 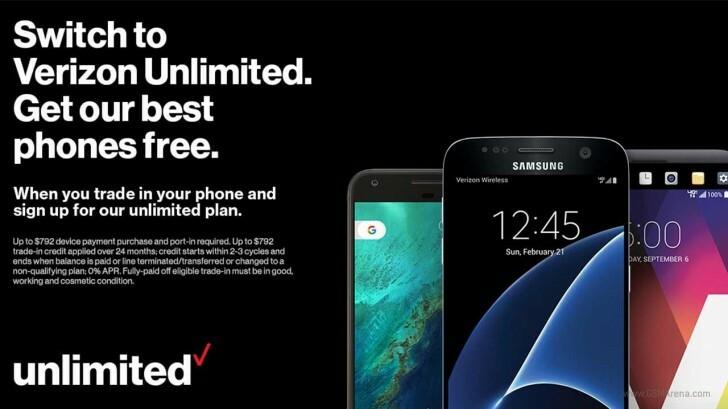 To make this even more appealing for those who are currently with another carrier, Verizon has a special offer for you if you want to switch to its network. If you trade in one of 14 eligible devices, you can receive any of "the hottest smartphones" for free. Here's the list of phones you can get for free: iPhone 7, iPhone 7 Plus, Google Pixel, Moto Z Droid, Moto Z Force Droid, Samsung Galaxy S7, Samsung Galaxy S7 edge, LG V20. And here's the list of devices you can trade in to be able to take advantage of this offer: iPhone 6, iPhone 6 Plus, iPhone 6S, iPhone 6S Plus, iPhone 7, iPhone 7 Plus, Samsung Galaxy S6, Samsung Galaxy S6 edge+, Samsung Galaxy S7, Samsung Galaxy S7 edge, Samsung Note 5, LG G5, LG V20, HTC 10. If you don't have any of those, there's another option. You can trade in an Apple iPhone SE, Samsung Note 4, Samsung Galaxy S5, LG G4, LG V10, or HTC M9. In this case you'll be able to grab one of the "hottest smartphones" listed above for $5 per month with a device payment plan. In all cases, the traded in smartphone needs to be "in good working cosmetic condition" for this to work. All pimps need discounts wtf you talking about? Bad news if you own a Sony phone!